Whilst Star Wars is an unparalleled brand juggernaut, success is far from guaranteed when creating content for and about it. Fans are fiercely protective and will not accept anything less than the best. The result was a fully operational arcade with three huge games as well as full user customisation options all contained within a custom Arcade hub. The Star Wars Arcade went on to be one of Disney EMEA’s most successful promotional games releases and was a finalist for both the BAFTA and Webby Awards along with numerous high profile industry wins. Tackling the brief to end all briefs and creating a totally new Star Wars experience. Disney EMEA came to us as they wanted to make a major splash with HTML5 gaming and push the Star Wars brand to a new generation of fans. 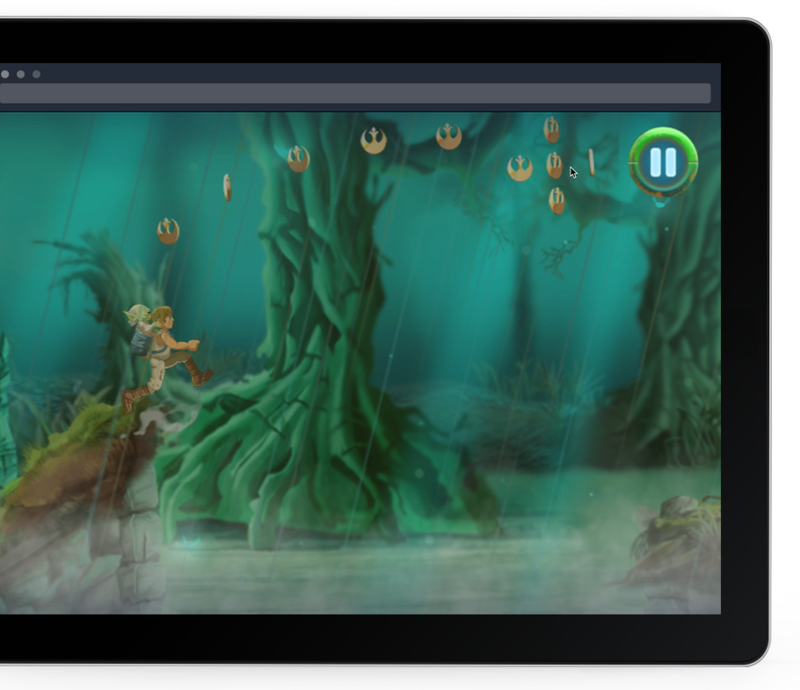 Previous games hadn’t pushed the mobile browser platform far enough and Lucasfilm were looking for proof that HTML5 technology was up to the job. 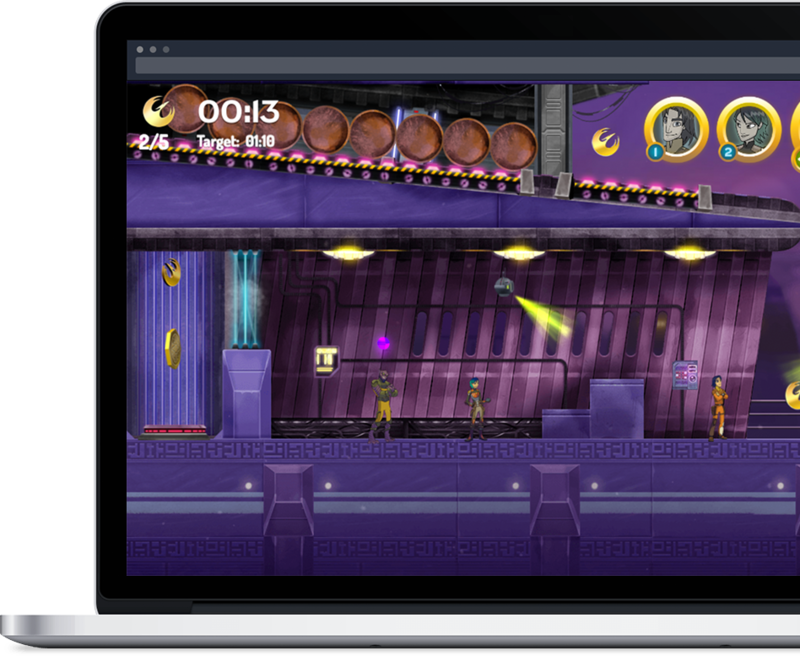 Our objective was clear – immerse a new generation of fans in a playable Star Wars universe and prove that HTML5 games can stack up in a world where apps are king. That being the mantra for Goodboy as a whole, we were well up for the challenge! Getting the chance to work on the Star Wars brand is of course something of a dream gig. And being a room full of SW geeks meant that there was no way we would deliver anything less than perfection. Our first challenge was exactly what parts of the Star Wars universe we would be looking at and how we would present it. Being a commercially driven project there were a huge number of stakeholders, brand owners and business goals to be satisfied. The games themselves would have to serve not just one, but three distinct Star Wars brands – Star Wars Rebels, the Disney XD CGI series was the first which taps into a new set of Star Wars characters familiar with kids. Star Wars ‘Classic’ would be a game inspired by part of the original Star Wars movies. The final game was a real treat where we got to create an original piece of content tied into the 2016 Blu Ray release of Star Wars: The Force Awakens. Working closely with Disney we developed three game styles that worked with very different parts of the SW Universe and allowed us to offer the broadest play experience across the games. For Star Wars Rebels we created ‘Team Tactics’ – a deep, level based adventure where players used the three key protagonists from the show. The game took the form of a physics puzzle platformer where each character has their own unique ability, as well as physical attributes. The big task was engendering a strong sense of narrative whilst balancing all the character’s capabilities and creating levels where players were always challenged but never overwhelmed with options. Add to that the fact we needed a full virtual UI for touch-screen and quick toggling between characters and the challenge was on. The resulting game set out each level as a single screen where everything the player needed to solve it was right there in front of them. Like tiny little Rube Goldberg machines, players would move their team around, combining skills and abilities to slowly crack each puzzle. Spread across four locations and culminating onboard an Imperial Star Destroyer, Team Tactics got our Star Wars Arcade off to an amazing start. For the next game, Yoda’s Jedi Training, we took players back to one of the classic moments in The Empire Strikes back. Playing as the reluctant Jedi, Luke Skywalker we made an endless runner with a difference. Taking place on the murky swamp world of Dagobah the game sees player running through swamps, treetops and even gloomy caves as they hone their Jedi steez. Whilst the scene of Luke running and flipping with our favourite space-muppet on his back is Growing it out into a full game AND keeping everything on-brand enough to get through approval was a huge challenge. We worked closely with Disney and Lucasfilm to create a world that whilst made of 100% bespoke, Goodboy created art was totally grounded in the lore of the film. Dynamic lighting and even weather changes all went into creating a game that took the limited source material and grew it into a fully featured, authentic game. The final game in the Arcade was X-Wing Fighter. This really brought the whole thing home as we got to create an original game for one of the biggest cinema events in recent years. 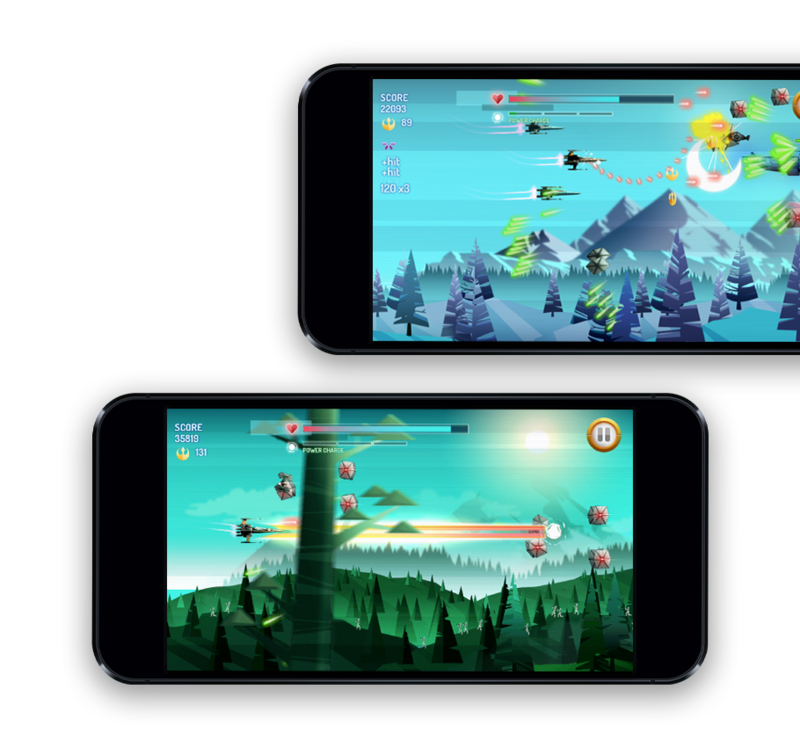 Having established that HTML5 was indeed up to the job and earned the trust of the client we were approved to make our classic shmup in a totally custom vector/gradient art style. Art was of course one of our big challenges here. As all the games were landscape mode it meant we’d be going with a side scroller shooter. For Poe Dameron’s iconic X-Wing this was fine, however Tie Fighters in profile are slightly less exciting as they become flat hexagons! A combination of offset parallax planes to make pseudo 3D, combined with real 3D renders for evasive barrel rolls meant that even viewed side-on, our Ties were both formidable and totally awesome looking! As with all the games, we had some specific brand concerns to deal with in X-Wing Fighter. After seeing an early pre-production build, Lucasfilm expressed concerns that the classic ‘fodder’ type behaviour of shoot ‘em up enemy ships was not quite right for First Order Tie Fighters. We worked extensively with Disney to create attack waves, ship strengths and aggression systems that meant that although still numerous, the Ties always felt like a threat. In addition to the narrative game we also created an endless mode meaning that once players had completed the game there was still plenty to return for, besting high scores, and working through the achievements list. Binding all the games together like some kind of ‘force’ was a global reward system that earned players tokens to be spent in the Arcade. These could be used to customise the player’s own SW themed room which also housed all their trophies and achievements. The Arcade has continued to grow and has had further games commissioned and added. Building in growth and future proofing our work with expansion considered from the outset is something we specialise in at Goodboy. Treating our games more like a service than a single product means that we can offer a unique level of value, both financially and in terms of ongoing customer engagement.